Ever thought you could manage a baseball team better than your local GM? 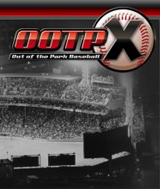 Well, now you have a chance to prove it, with Out of the Park Baseball X. It's a gaming experience far beyond fantasy baseball. Define your own baseball world with customizable league structures and rules, full control over promotions, trading, drafts, and more. The pitch-by-pitch, play-by-play engine lets you play out the games of your dreams! Control manager functions, including: lineups and depth charts, pitching rotation / bullpen, player and team strategy. Any historical season between 1871 and 2008 included. Solo or online play with unlimited seasons. Customizable player photos, team logos, jerseys, and ballcaps. Comments: This game was the pits while your trying to play for the different positions it's really hard. An gettting the players to do what you want. Takes to much out of a person also the controling of the game plus the people needs improvement. Ok for all ages to play but it not be worth it. Comments: I will leave this game to the die hard baseball fans. It is not for me. I found no fun at all in it. It was way too complicated drafting the players, etc. I couldn't wait for the 1/2 hour to be over.